One of the biggest changes is a larger, bolder typeface for both calories and serving sizes. The typeface will be easier for people to see and read. In 2016, the U.S. Food and Drug Administration announced the updated food nutrition label design. According to the FDA, the new design was part of an effort to reflect updated scientific findings to help consumers make better-informed decisions about food choices and maintaining healthy diets. While the new labels are already on about 10 percent of food packages currently being sold, the FDA is requiring food manufacturers with $10 million or more in annual food sales to have the labels on all of their products by next year. Manufacturers with less than $10 million in annual food sales will have until 2021 to put the new labels on all of their food products, the FDA said. The labels will also list added sugars, which are either added during the processing of foods or are packaged as such; free sugars, mono-sugars, and disaccharides; sugars from syrups and honey; and sugars from concentrated fruit or vegetable juices. Vitamin D and potassium will also be added to the list of nutrients required on the labels, whereas Vitamins A and C are no longer required to be listed. However, manufacturers can still list Vitamins A and C if they wish. The information on daily values for nutrients such as sodium, dietary fiber, and Vitamin D have been updated and are used to calculate the percentage of Daily Value (DV) that are on the labels. The percentage of DV provides nutrition information in the context of a daily diet based on 2,000 calories per day. 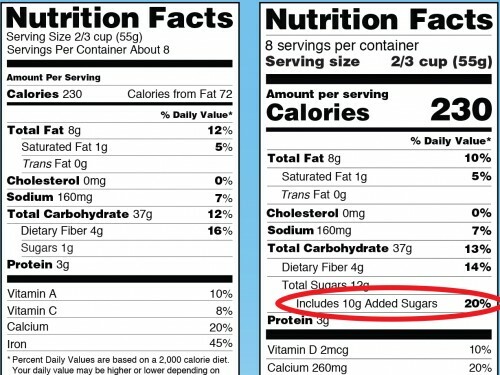 Lastly, the new labels will no longer list calories from fats. For more information on reading the new food labels, see ohioline.osu.edu/factsheet/hyg-5586.